This document provides a measurement of the political interests of Facebook users in Malaysia and a brief analysis of recent trends. This is based on public information collected from Facebook. Characteristics and interests were chosen based on what would be most relevant to political analysts. Statistics cover users aged 21 years and older unless otherwise specified. Total population refers to Facebook users aged 13 years and above. Potential voters refer to Facebook users aged 21 years and above. Youth refers to Facebook users aged 13 – 20 years. Gender breakdown figures do not add up to the total. This may be due to Facebook users not sharing their gender, and also due to rounding errors by Facebook when dealing with specific age groups. Figures provided by Facebook are estimates. Some inaccuracies are to be expected. Facebook users residing in Malaysia are not necessarily Malaysian citizens. Interest in a topic is equal to the number of users expressing interest in a topic. To measure interest we used a combination of Facebook Topics (a collection of interests, activities, groups, pages, status updates and job history identified by a common term determined by Facebook e.g. ‘United Malays National Organization’) and specific Group and Page names (e.g. Friends of BN). Audience refers to the population of users that express interest in a topic. Based on our research to date, Pages that are of type ‘politician’ are not always included under related Facebook Topics. For example, not all ‘Tony Pua’ (MP, PJ Utara, DAP) Page likes are included under interest in ‘DAP’. However because Facebook does not make Topic details available we cannot easily determine which politicians, if any, were included. Statistics on the Opposition primarily refer to component parties of the former Pakatan Rakyat – PKR, PAS and DAP. Interest in PSM is included in total statistics for the Opposition, but is not listed separately due to its small audience. The following table shows a list of acronyms used in this document. Malaysia currently has a total population of 18 million Facebook users. There are 9.9 million men and 7.8 million women. 55% of users are male and 43% are female. Out of the total population, there are 14 million users (78%) above 21 years old who are potential voters. There are 7.9 million men and 6.1 million women. 56% of potential voters are male and 44% are female. The table below lists the number of users (aged 13 and above) within each state. Due to rounding issues and users linked to multiple states, there is some overlap particularly between KL and Selangor. For accuracy we have listed the totals for KL+Selangor combined. 49.44% of Facebook users in Malaysia are located in KL and Selangor. According to the National Census (2010), only 24% of Malaysia’s total population reside in KL and Selangor. There is a significant imbalance there. Trending content, views and opinions expressed on Facebook can be easily biased by users KL and Selangor. From the total potential voter population of 14 million users, 7.8 million users like the Opposition or BN. This means 55.7% of potential voters are interested in political parties. 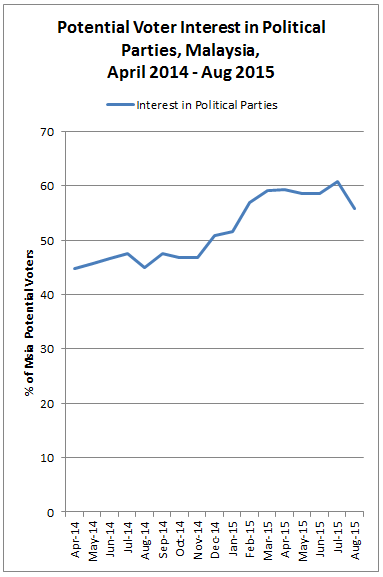 In December 2012 only 9% of potential voters were interested in political parties. From the 7.8 million users interested in political parties, 4.5 million (58%) are male and 3.2 million (41%) are female. The level of interest has dropped from July’s level of 60.7% to 55.7%, with no corresponding change in Malaysia’s Facebook user population. This indicates people talking less about political parties and/or un-liking politically-affiliated pages and groups. This sudden drop may be due to political issues occurring during the months of June and July, because events may take 1-2 months to affect stats. Interest in political parties is male-dominated; however female representation has increased from 36% of potential voters (December 2012) to 41% of potential voters. 7.88 million users are interested in BN. 4.72 million (59.9%) are male and 3.16 million (40.1%) are female. 6.13 million users are interested in the Opposition. 3.94 million (64.3%) are male and 2.17 million (35.4%) are female. 7 million users are interested in BN. 4.1 million (58.6%) are male and 2.9 million (41.4%) are female. 5.4 million users are interested in the Opposition. 3.5 million (64.8%) are male and 1.9 million (35.2%) are female. 7.8 million users are interested in BN or the Opposition. This is the total level of interest in political parties, with significant overlap between both coalitions. 4.5 million (58%) are male and 3.2 million (41%) are female. The charts below show the division of interest by age group for users aged 13 and above. The Opposition draws more interest from older users with 23% of their audience aged 41 years and older. 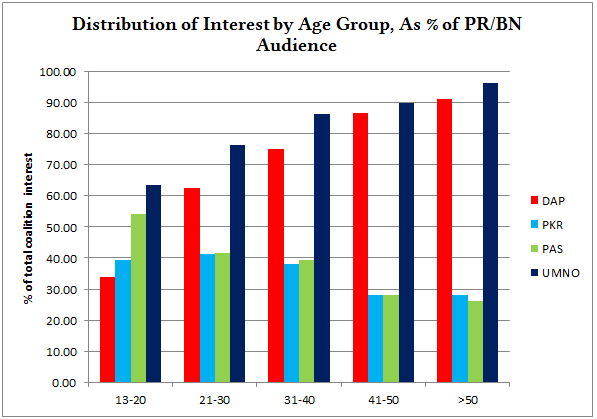 Only 17% of BN’s audience comes from this age group. The majority of the potential voter population is consistently interested in both the Opposition and BN, with 58.97% showing mixed interest in August. The Opposition has consistently maintained the lowest share of exclusive interest with the lowest point between April – June. BN has maintained a steady level of exclusive interest within a range of 26% – 36%. DAP and UMNO are the parties with the largest audiences (i.e. most popular) within their respective coalitions. 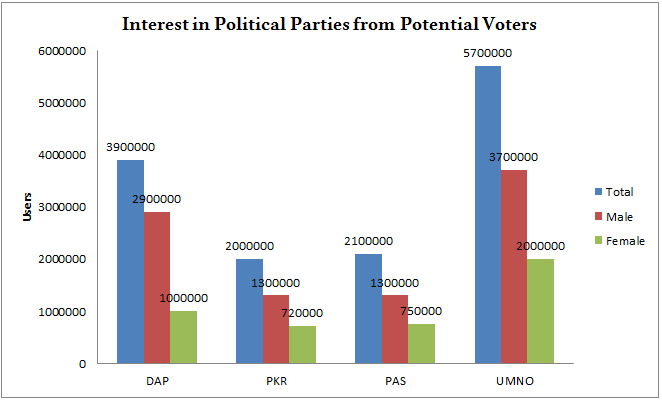 Interest in DAP is almost equal to PKR and PAS combined. UMNO is particularly dominant within BN because the 2nd-most popular party is MCA with only 10.7% share of BN’s audience. DAP’s audience is the most male-dominant with 74.4% of interest in DAP coming from male users. This is well above the 58% male audience that is interested in all political parties. The following charts show the trend in interest levels per month for each party since May 2014. DAP and UMNO’s similar patterns indicate a close relationship. We can theorise that this is due to supporters from both parties talking about each other in addition to their own party. News reports on DAP and UMNO would also contribute to this trend. However DAP has been losing interest from women since June 2015. If this trend continues the close relationship between UMNO and DAP may start to change in the next few months. Interest in PKR has almost recovered since it took a heavy loss in interest following the resolution of the Selangor Menteri Besar Crisis in September 2014. 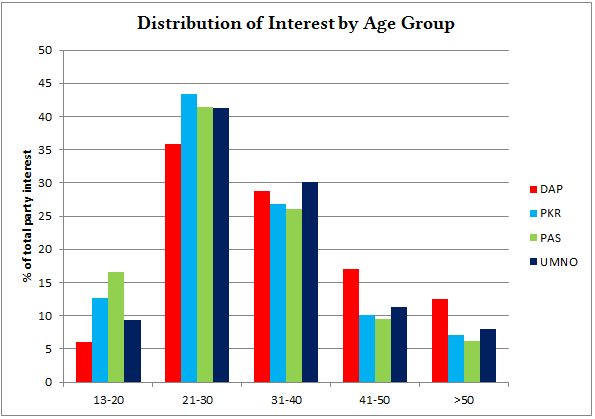 The table below lists the distribution of interest for each party by age group as a percentage of the total interest for each party. For example, 5.98% of DAP’s total interest comes from users aged 13-20 years. For comparison we have included Malaysia’s distribution of users in the final column. The highest percentage of interest for all parties comes from users aged 21-30 years. This is to be expected as this is the largest age group in Malaysia with 40% of the total population. DAP has the highest level of interest from older users aged 41 and above, compared to other parties. 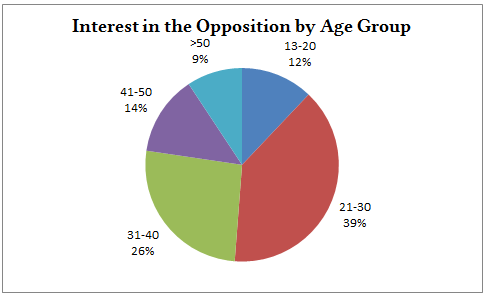 DAP also has the lowest level of interest from the youth aged 13-20 and 21-30. DAP’s appeal comes from middle-aged and older voters. PKR has the highest level of interest from users aged 21-30 compared to other parties. PAS has the highest level of interest from users aged 13-20. Their closest competitor is PKR. Unlike DAP both parties are likely to gain higher levels of interest from potential voters as users cross 21 years of age. 58% of interest in PAS comes from users aged 13-30. This is higher than all other parties. UMNO has a higher level of interest from users aged 31 and above, compared to PKR and PAS. Interest in UMNO is not leaning towards the youth as much as those parties, with only 50.4% of interest coming from users aged 13-30. Like DAP, UMNO has a strong level of interest from users aged 31 and above, though they have a much higher share of interest from the 21-30 year olds compared to DAP. The table below lists the percentage of male interest for each party by age group. For example, 80% of DAP’s total interest aged 13-20 years comes from male users. For comparison we have included Malaysia’s distribution of users in the final column. Interest in political parties is male-dominated, however it is particularly high for DAP for ages 13 – 40 years and UMNO for ages 13 – 20 years. The table below lists the distribution of interest for each party by age group as a percentage of total interest for the party’s coalition (the Opposition or BN). For example, 63.44% of BN’s audience aged 13-20 is interested in UMNO while 33.78% of the Opposition’s audience is interested in DAP. DAP and UMNO draw the largest share of interest for the Opposition and BN in other age groups because they are the 2 largest parties in each coalition. Compared to DAP’s share of the Opposition, UMNO is responsible for a greater share of interest for BN due to the lack of well-represented partners. PAS and UMNO draw the largest share of interest from 13-20 year olds in their respective coalitions. This points to DAP’s stronger appeal with older users and PAS’ stronger appeal with young users. PAS leads PKR for users aged 13 – 40. For users aged 51 and above PKR’s audience represents a higher share of the Opposition than PAS’ audience. The chart below shows how interest is divided between PAS, PKR and DAP. The combined interest in all 3 parties represents 5.2 million users (96.3% of the Opposition). The high percentage of users interested in all 3 parties indicates how effective the Pakatan Rakyat brand was. There is also more overlap between PKR and PAS than PKR and DAP. Due to UMNO representing 81.4% of BN with no close contender within BN, we are unable to perform a similar breakdown of individual BN component parties. The table below lists the distribution of interest for each party by state as a percentage of the total interest for each party. For example, 12.56% of DAP’s audience comes from users in Johor. For comparison we have included Malaysia’s distribution of users in the final column. Due to rounding issues and users linked to multiple states, there is some overlap particularly between KL and Selangor. KL and Selangor combined contribute the highest share of interest for all parties. As was the case with 21-30 year old users this is to be expected. Almost half the nation’s users are based in this region. DAP has a higher than average share of audience coming from KL and Selangor (51.28% versus national distribution of 49.44%). PAS has the lowest share at 46.19%. DAP has the strongest share of audience from Sabah and Sarawak. UMNO is a close second. UMNO’s audience is more concentrated in Johor, Labuan, Melaka and Negeri Sembilan compared to other parties. PAS’ audience is more heavily concentrated in users from Kedah, Kelantan, Terengganu, Pahang, Perak and Perlis compared to other parties. PKR’s audience is more heavily concentrated in users from Penang and Selangor compared to other parties. The key point from these statistics is that alternative media with an emphasis on political coverage have largely male audiences. Coverage by Malaysiakini (75%), The Malaysian Insider (84.5%) and Free Malaysia Today (64%) are likely to be less effective at reaching women. The table below shows the percentage of each media’s audience that also shows interest in political parties. UMNO is the most popular with 80% of the English Media audience and 80.5% of the Bahasa Malaysia Media audience showing interest in UMNO. Within the Opposition, DAP is the most popular with English Media and Bahasa Malaysia Media audiences. PKR and PAS do not do as well with any media audiences though it is worth noting that PKR is more liked by the Chinese Media audience than the other parties. The table below lists the individual breakdown for English Media. The overlap with political parties could not be calculated for media with smaller audiences and is marked with an asterisk (*). Each media entity will have its own focus on coverage of different political parties. When looking at these figures it is important to compare the size of the audience and the gender balance. A high percentage overlap has less value if it is from a small media entity. Malaysiakini’s and The Malaysian Insider’s audiences have a strong interest in DAP and UMNO. Both these audiences have a high percentage of men, which means that coverage from these media will not improve the gender balance of interest in both parties. NST’s audience has very little overlap with DAP, unlike other parties. PKR and PAS statistics are very similar, with PAS having a slim lead over PKR for some Bahasa Malaysia media and PKR having a lead over other parties in Chinese Media. Interest in politics from Facebook users in Malaysia has dropped by 5%, though there are indications it will increase in September. Mixed interest from potential voters remains high at 58.97%. This is beneficial for the population as it indicates awareness of news and content related to both BN and the Opposition. However since November 2013 the Opposition has consistently trailed behind BN both in terms of total users and exclusive interest from potential voters. 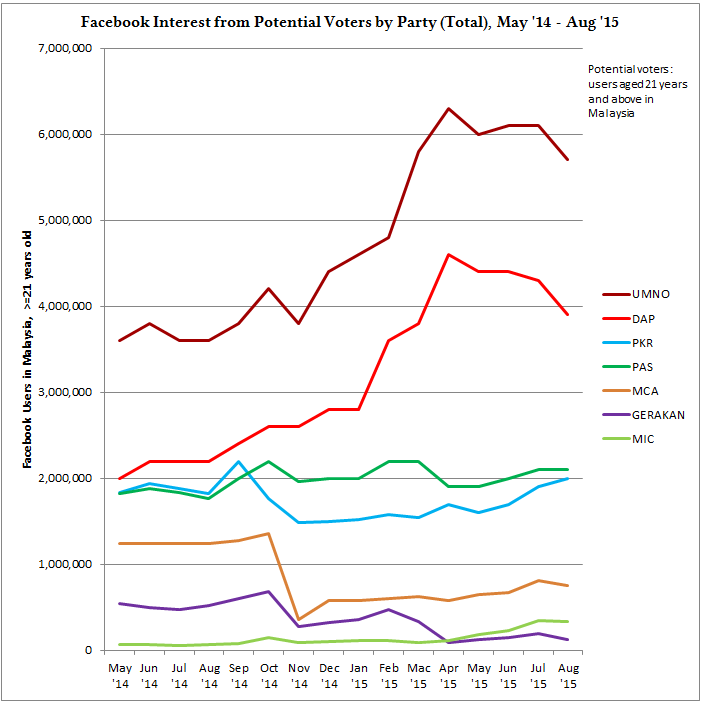 The 2 parties that dominate political interest on Facebook are UMNO and DAP. BN’s strongest party is UMNO, which represents 81.4% of interest in BN. The second strongest party is MCA which represents 10.7% of interest in BN. Such a large gap means that UMNO has no effective competitor within BN on Facebook. 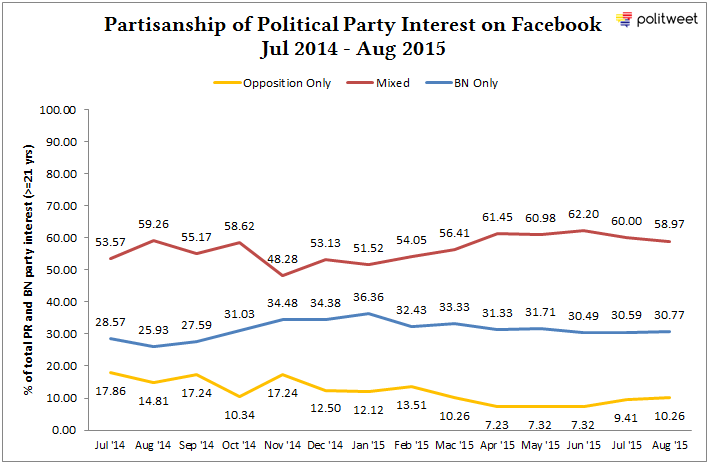 The Opposition’s strongest party on Facebook is DAP which exclusively holds 44% of total interest in the Opposition from potential voters. 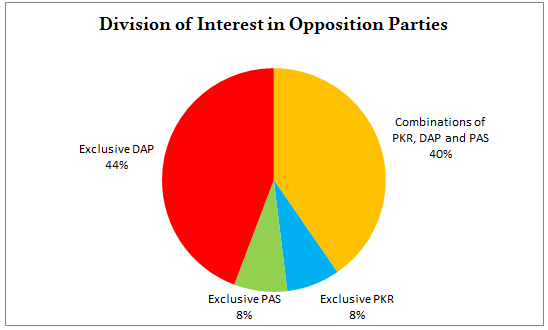 Including the overlap with PKR and PAS, DAP represents 72% of total interest in the Opposition. PAS and PKR only hold 8% exclusive interest each, which means they lack strong representation of their brand name on Facebook. Based on interest from the media audiences it is not likely for both parties to gain popularity through the media. Without DAP the Opposition would only have interest from 3.1 million potential voters instead of 5.4 million potential voters. Compared to BN’s 7 million potential voters this makes DAP indispensable for Opposition campaigning on Facebook. DAP is also the most popular Opposition party for audiences of English and Bahasa Malaysia Media. DAP draws more interest from older users than young users. Almost one-third of their audience comes from users aged 41 years and above. DAP also draws less interest from the youth (aged 13 – 20) than any other party. Only 6% of their audience comes from youth. This would include college and university students who will be first-time voters in the next general election. Interest in DAP is too male-dominant with 80% of interest from users aged 13 – 30 being male. 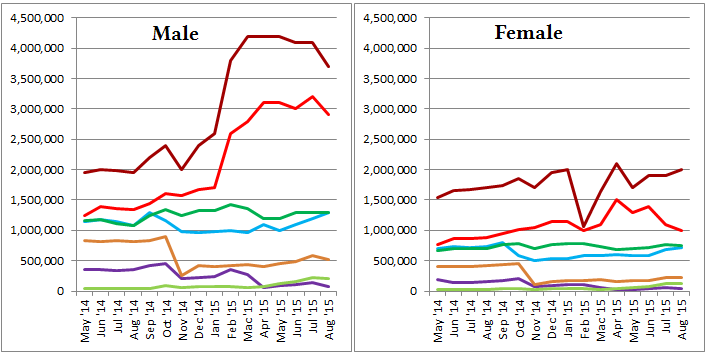 Additionally, DAP has been experiencing a decline in interest from women since July 2015. PAS and PKR are more balanced in terms of gender ratio though still largely male. When it comes to youth, PAS is the Opposition’s biggest contributor. 54% of youth interested in the Opposition are interested in PAS. Without changes in DAP’s messaging they may lose out to PAS in the 21-30 year old segment as these youth become potential voters in the next few years. On the whole the Opposition may continue to lose out to BN on Facebook. This is because BN has consistently maintained an exclusive share of interest close to 30% of the potential voter population and Pakatan Rakyat as a coalition and brand name no longer exist.